Location: Take I-66 to exit. 75 (Rt. 110 South). Go approximately 3 miles. Rt. 110 South turns into Rt. 1 South (Jefferson Davis Hwy). Take Rt. 1 South (Jefferson Davis Hwy) to 4th traffic light (27th Street). 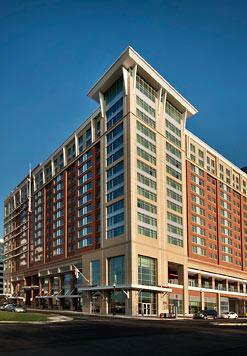 Turn left at 27th Street, our lodging near Reagan National Airport will be on the left. T-Mobile Wireless High Speed Internet (fees apply), Cable Television with Remote Control, Voicemail, valet parking (fee), High-Speed Internet-Wired, T-Mobile Hotspot Wireless Broadband, Business Center, Complimentary Shuttle hours 5:30am-12 midnight, Concierge, Gift shop, Laundry, Soda & ice machines, Dining on-site. Railroad View: Fair, narrow view. Rooms on the east side of the building, south end provide a railroad view. The view looks between buildings. Rooms that offer a railroad view are very limited in this hotel. Residence Inn across the street is a better choice for a railroad view. Railroads past Hotel: CSX / Amtrak / Virginia Railway Express (commuter railroad). Expect about 53 passenger trains during a 24-hour period, and about 15-20 freights a day. There are no passenger trains over night, the railroad gets quiet between 8pm and 5am, some freights may appear, but more pass during the daylight. In the distance you can view the METRO Transit light rail line. Photo Comment: This aerial view is a few years old. The Hyatt is circled in yellow. The red "X" marks an area of recent construction of a new Residence Inn (also listed on this web site). A new hotel on that property has diminished most of the railroad view from this Hyatt. The street is the savior for a view from the Hyatt. Rooms on the southeast side of the building will provide a limited railroad view. The the distance you maybe able to see the elevated METRO Transit line seen on the lower right side of this photo. Location: US Route 1 South. Turn left at the first light onto 27th Street. Turn left onto Crystal Drive. Hotel is on right. About Hotel: BRAND NEW! 14-Floors, 325-Rooms, Interior Corridor, High-Speed Internet, On-Site Parking (fee), Pets Allowed (fee), Buffet breakfast, Coffee in lobby, Coffee/tea in-room, Evening reception, Air conditioning, Alarm clock, Crib, Individual climate control, Iron and ironing board, Hair dryer, Color Cable/satellite TV with HBO, Conventional oven, Dishwasher, Microwave oven, Pots, pans, serving dishes, Refrigerator, Refrigerator with ice-maker, Silverware, Stove, Table and chairs, Phone with voice mail, Fitness Center, Indoor Pool. Railroad View: Excellent View! Located next to the train tracks! Any rooms on the railroad side of the building will offer a railroad view. Higher floors are better. Comments: Don't miss Long Bridge Park located north of this motel, its a new park in Arlington built with the railfan in mind, excellent views of the railroad from an elevated walkway along the tracks. 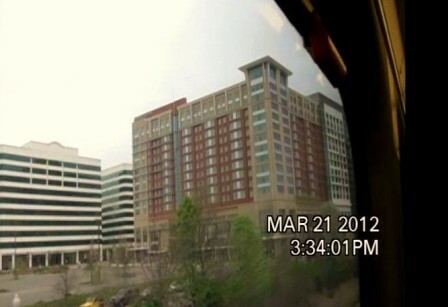 Photo Comment: A photo taken from on-board a Virginia Railway Express commuter train shows the Residence Inn from the train. A good 50% of rooms at this motel will offer an excellent railroad view, rooms on the north side will offer a narrow view. Ask for rooms on the east or south sides of the building for the best view (those are the sides you see here), east side rooms are directly along the tracks. Location: I-95 to 395 North. From 395 North take the Pentagon City/Crystal City Exit. Then turn left onto Army Navy Drive. The hotel will be on the right hand side 3 blocks down. About Hotel: BRAND NEW! -Floors, -Rooms, Interior Corridor, No Pets Allowed, Parking ($$ fee), 100% non-smoking, Business Center, Cribs, High chairs, Car Rental Desk, Coin Laundry, Concierge Desk, Elevators, Local Area Transportation, Lounge, On-Site Convenience Store, Room Service, Fitness Room, Health Club, Jogging Trails, Pool, Sight Seeing Tours, Air Conditioning, Clock Radio w/ MP3 Connection, Ergonomic Desk Chair, HD Channels LCD Flat Panel 37" TV, Video Games featured on TV, Coffee Maker, Hairdryer, High Speed Internet Access, Iron/Ironing Board, Newspaper (M-F). Railroad View: Expect a good distant view of the railroad from high floor rooms on the north or east side of the hotel. 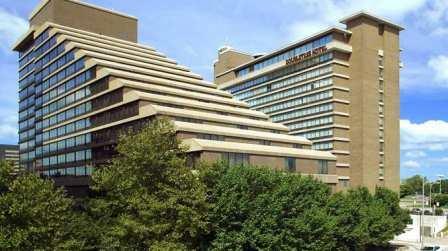 Just ask for a high floor room overlooking Long Bridge Park! Railroads past Hotel: CSX / Amtrak / Virginia Railway Express (commuter railroad). Expect about 53 passenger trains during a 24-hour period, and about 15-20 freights a day. There are no passenger trains over night, the railroad gets quiet between 8pm and 5am, some freights may appear, but more pass during the daylight. 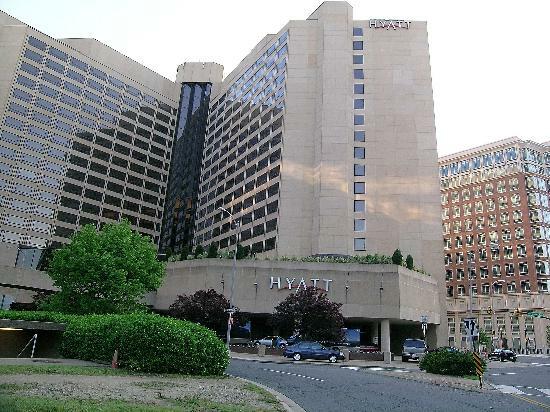 Comments: Don't miss Long Bridge Park located just north of this hotel, its a new park in Arlington built with the railfan in mind, excellent views of the railroad from an elevated walkway along the tracks. Click here for details about the Railfaning from Long Bridge Park. 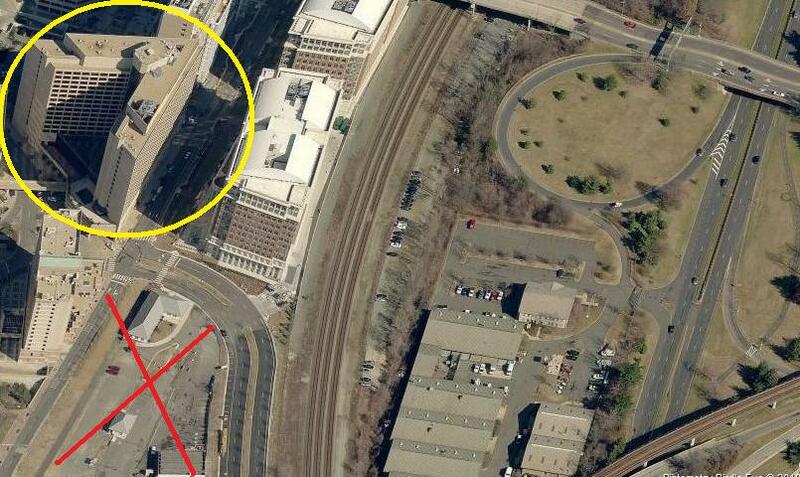 Photo Comment: The aerial photo shows the hotel circled in yellow. The railroad is marked with blue. 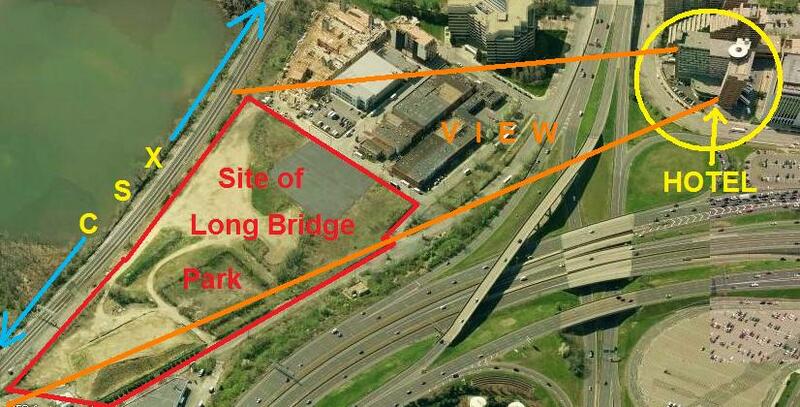 The view is outlined in orange, and the the current site of Long Bridge Park is outlined with red. If staying in this hotel, don't miss a visit to Long Bridge Park. The east side of the park was built with railfans in mind. In between trains, you maybe entertained by the parade of aircraft's landing and departing from Regan Nation Airport, located just across the small body of water. Planes using runways 15 and 19 cross right over the park.